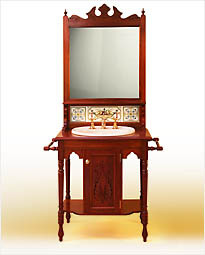 Extravagantly 19th century style, the Victorian 940 Solid Cedar Timber Washstand is a traditional style vanity with a handsome advantage to small bathrooms. The sophistication of the design and quality of craftsmanship is evident in the joinery and finish of this old-time favourite and traditional solid cedar timber washstand. Victorian style bathrooms originated during the Victorian era; it was an era of innovation and invention. Today, your choice of bathroom styles is rich and wide ranging. You may be interested in creating something altogether different than the style of your home, or you may have geared your renovation to complement your surrounding. Whatever your motivation and desires are, if your heart is set on creating a warm atmosphere apparent in many heritage homes, an original Victorian design bathroom can co-exist with modern amenities with all the appeal and grandeur of a stately Victorian home. In other words, you can capture the charm of a time past while ensuring your bathroom is not without the all-important creature comforts. 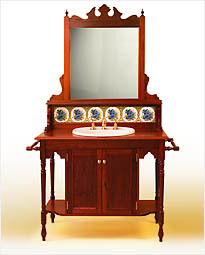 Colonial Living's Victorian washstands are everything a bathroom vanity should be, plus a lot more. Our washstands are crafted in solid red cedar with an arresting display of timber craftsmanship; shaping and carving played an important role in the design of Victorian furniture.